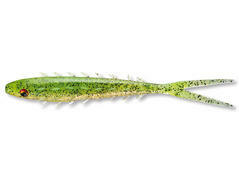 Looks like a jerk, swims like a jerk, works like a jerk – feels like a soft lure. 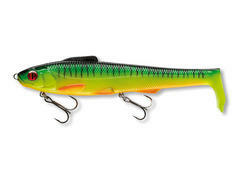 This extraordinary jerkbait fuses the advantages of a hard lure with the ones of a soft lure. The Prorex Jelly Jerk can easily be brought into action by short strokes with the rod tip and then displays a flanking action. At retrieving stops the lure dwindles down very slowly with flanking moves. Thanks to its slow sinking speed, the Jelly Jerk is especially suited for fishing in shallow areas and over weedy spots. This lure can be presented very slowly. This small creature bait imitates a small crayfish and is particularly suited for fishing for perch and zander. By using tungsten powder at the core, this lure obtains a very high own weight – perfect for fishing with offset hook and baitcasting reel. Enormous casting distances are possible also without additional lead. The pincers at the front can be customized with the help of a knife. 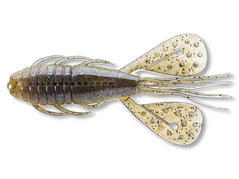 The Both Craw is also a good choice for the dropshot rig. This XL shad is a real magnet especially for large pikes, since it produces strong vibes thanks to its large DuckFin tail. The action is characterized by slight flanking moves and is mainly driven by the broad swing of the tail section. Our test anglers were able to achieve extraordinary good results with this lure throughout the whole season. The highlight of the Hollow Lunker is its hollow body design with the inner wire weight system. Thus the Hollow Lunker appears nature-like and convinces even very cautious predators. Perfect for heavily frequented waters! The well-known and successful DuckFin shad is also available as micro version with 45mm length for ultra-light fishing for perch, chub, zander and trout. 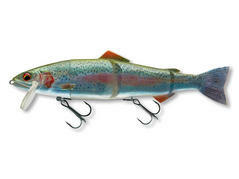 Despite its low body mass this lure features a strong tilting and wobbling action under water. The Prorex Micro Shad 45DF furthermore is perfectly suited for use with the new Prorex Flexi Jig tungsten jigheads for ultra-light fishing. 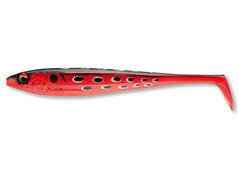 With its size of 23cm the Prorex Hybrid Trout is just the right snack for large pikes and zanders. The nature-like body silhouette combined with the 3D live print lead to a highly realistic design, which is hard to distinguish from a real trout. 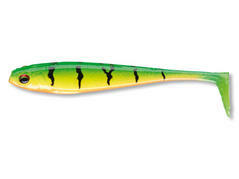 Already at slow speed, this lure features a vivid action, which perfectly imitates a hurt prey fish. 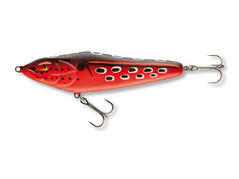 At somewhat higher speed this lure strongly flanks and thus causes strong blast vibes in the water. Matching spare tails for the Prorex Hybrid Trout in length 23cm. Thanks to the special shape and design the spare tail can be precisely glued to the head without getting out of place. This set comprises the two fitting diving lips for the Prorex Hybrid Trout 230 (slow sinking). Perfect, when a diving lip gets lost in the heat of the moment. 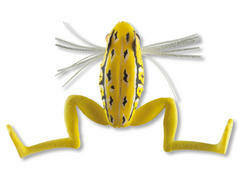 This micro frog with only 3.5cm body length has been designed especially for fishing for perch and asp. Thanks to the floating design the Prorex Micro Frog can be presented on the surface with short strokes and appears like a real frog. Additionally the Micro Frog is perfectly suited for the use at the dropshot or Caroline rig – the original DuckFin tails at the legs care for a natural action and ensure high attraction. The special rubber mixture is highly elastic and flexible, thus enabling the catch of numerous perches and asps whiteout harming the lure. An exceptional lure for large specimen! 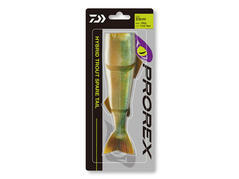 The well-known DuckFin shad is also available as XL version within our Prorex range. The DuckFin tail cares for strong rolling movements even at slow speed – perfect for the spring season or at cold water, when the lure is presented very slowly. 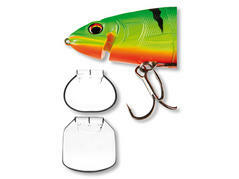 At shallow waters this lure can be applied perfectly in combination with the Prorex screw-in system and stinger hook. Perfect for large pikes and zanders. The body shape of this shad with V-tail is based on the well-known and extremely successful DuckFin shad from the DAIWA range. The hydro-pins at the body produce vibrations even at slightest movements of the rod and are of special advantage at pelagic fishing for zander and pike, when the lure should be presented in a more calm way. A glass rattle has been integrated within the tail of the lure, which additionally is provoking attacks due to the slight "click" sounds. The extra-soft rubber formulation contains real shrimp flavor, which cares for additional attraction.